The new menu items were inspired by different flavours from Asia. 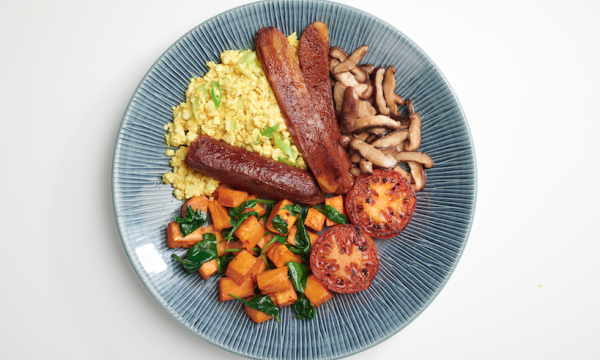 Wagamama has launched its first ever full English vegan breakfast range in a bid to meet growing consumer demand. The full breakfast range includes: The full vegan (two rashers of maple seitan ‘bacon’, beetroot and seitan sausages, scrambled turmeric tofu, grilled tomato, wilted spinach, sautéed sweet potato and shiitake mushrooms), and the vegan roti wrap (a thai flatbread served rolled up with spinach, mixed mushroom, shichimi tofu and sriracha mayonnaise). “When we create vegan dishes we primarily want them to taste amazing so anyone can enjoy them, not just vegans. I’m particularly proud of the full vegan as everyone loves the variety of a cooked breakfast and the range of flavours we have compiled in this dish makes sure that this is guaranteed to excite everyone’s taste buds," Wagamama executive chef Steve Mangleshot explained. The new items, designed to appeal to a growing vegan market, will be launched at Wagamama’s UK airport restaurants at Gatwick and Heathrow on 6 February.